Set in the quiet village of Over Haddon and within 300 yards of the Lathkill Dale National Nature Reserve with its high limestone countryside, clear streams, secluded woods and abundant wildlife, Lower Folds offers the perfect base to explore the Peak District National Park whether by car, bike or on foot. We like to offer maximum flexibility to our guests for arrival and departure days rather than have strict changeover days so please call first to discuss your preferred dates. 2 bedroomed (1 double / 1 twin) plus travel cot beautifully presented cottage offering country living with modern amenities e.g. free WiFi, satellite TV, DVD, iPhone / iPod docking station. 4 golf courses (Ashbourne, Bakewell, Buxton High Peak & Cavendish). Further afield you can enjoy the Staffordshire Potteries, Alton Towers, and the National Memorial Arboretum. Or you can just relax by the fire or in the private walled rear garden and enjoy the views across paddocks and open farmland. Family friendly. Cyclists welcome (secured shed available for bike storage). Well behaved dogs (2 max) welcome @ £25 per stay - downstairs only. Lower Folds is owned by husband and wife Steve and Lindsay who live in the neighbouring county of Staffordshire. We have always loved visiting and walking in the Peak District. We take great pride in being able to offer high quality holiday accommodation to our guests. We always endeavour to welcome guests personally to the cottage and we are on hand to offer advice on the local area and to respond to any events needing immediate attention. As dog lovers ourselves, we don't believe that you should have to compromise on the quality and comfort of your accommodation in order to bring your dog with you on holiday. We look forward to welcoming you to Lower Folds. We had searched for the perfect property in the Peak District for many years. Our criteria was simple but surprisingly difficult to satisfy. The cottage had to: - be in the National Park - be within walking distance of a good "foodie" pub or restaurant - have its own private garden to provide a secure environment for young families and dogs - and have its own parking so that you don't have to spend your precious holiday time hunting for a space. We stumbled across Lower Folds in Over Haddon on one of our many walks and knew immediately that it was the one for us. We think it's perfect to unwind and relax and we hope you will too. Lower Folds is conveniently located in the quiet village of Over Haddon yet only 2.5 miles from the all the shops, restaurants and amenities offered in Bakewell. Over Haddon overlooks the National Nature Reserve of Lathkill Dale, one of the most beautiful dales in the Peak District. Within walking distance of Lower Folds is the CAMRA awarding winning Lathkil Hotel serving excellent food and a wide selection of real ales, ciders, lagers and wines. Also within walking distance of Lower Folds is the Garden Tea Rooms serving hot drinks and sumptuous home made cakes. Bathroom with bath / shower over. Landline telephone for 999 outgoing and all incoming calls. Egyptian cotton bedlinen throughout. 2 Towels per guest. Tea Towels and hand towel in kitchen. Hand Towel in downstairs cloakroom. No linen for travel cot. 2 towels per guest. Hand Towel in downstairs cloakroom. Tea towels and hand towel in kitchen. Oak dining table, 4 chairs + high chair; 2 x 2-seater leather sofas; Freesat TV; DVD player; Selection of DVD's, books & board games; Oak flooring. Selection of fiction, non fiction, local walking guides and maps. Warm cosy cottage in beautiful location. Our second visit to this lovely clean and cosy cottage. A warm welcome from Lyndsay and the best welcome pack. 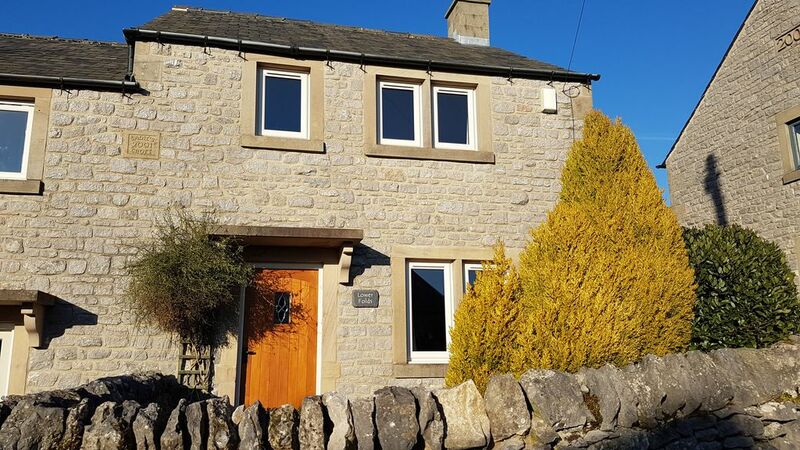 The cottage is not too far from Bakewell in a stunning location with a dog friendly village pub, with plenty of walks straight from the door. Can’t wait to return! It was great to welcome you all back to Lower Folds. I'm really pleased you enjoyed your second stay in Over Haddon and I hope to welcome you back again soon. Lower Folds Cottage is a gem and Lyndsay gave us a wonderful warm welcome. Such a comfy cosy cottage and so well placed for excellent walks we would definitely love to return. There is a dog friendly pub a few hundred yards away with stunning views and it's an easy 2 mile walk into Bakewell across fields. There are many other walks and excellent pubs and cafes nearby. We thoroughly enjoyed our 3 night stay. Thank you so much for your kind review. I am really pleased that you all, including Skye, enjoyed your birthday weekend. We are very lucky to have so many fantastic walks on our doorstep plus of course, a great pub in the village for post (or pre!) walk refreshments. Hope to welcome you back again soon. Amazingly clean and well equipped. A beautiful cottage in a lovely village location. We were given an amazingly warm welcome by the owner. The cottage is lovely and the views around the village are glorious. Very convenient for Bakewell and a number of local walks. Couldn't have chosen a better place to stay. Thank you for your 5 star review. I am delighted that you enjoyed your stay at Lower Folds and that the weather stayed kind for you to explore the Peak District. It was a pleasure to meet you and your family and I hope to welcome you back again soon. We spent a most enjoyable few days at Lower Folds. The cottage is so comfortable and well equipped and in a great location with beautiful walks available from the front door. Lindsay met us on arrival, made us a most welcome drink and provided us with much information enabling us to make the most of our stay. We would definitely stay here again when we next return to this lovely area. Thank you both very much for your kind words. I'm really pleased that you enjoyed your stay at Lower Folds and that you and your dogs were able to enjoy the beautiful walking around Over Haddon without getting too hot in this scorching weather . Hope to welcome you back again soon. We had a fantastic weekend at Lower Folds. Lovely welcome from Lindsay at the cottage who told us about walks straight from the cottage door and made us a pot of tea! The cottage is well equipped and beautifully decorated. The welcome pack of bread, butter, milk, wine and doggie biscuits was much appreciated. It’s such a beautiful area away from the hustle and bustle of Bakewell but close enough to get supplies. We will definitely be staying here again! Thank you for your lovely feedback. I am so pleased that you enjoyed your stay at Lower Folds and that the Derbyshire weather was kind to you so that you could get out walking in and around Over Haddon. It will be our pleasure to welcome you and Coco back soon. There are numerous flat cycle routes e.g. the Monsal Trail / the Tissington Trail which are on old railway lines and now dedicated cycle / pedestrian trails. Cycle hire is available. There are also many hill tracks and trails. Fly fishing is available nearby on the River Wye. Birmingham Airport - 75 miles. Local bus routes can be used if you want to avoid a car. The nearest train stations are Grindleford or Chesterfield. 2.5 miles from Bakewell with an abundance of restaurants and bars plus banks, post office and shops including the home of the famous Bakewell Pudding. Bakewell also hosts a Monday market and a regular farmers market. Over Haddon is within free delivery distance of a number of takeaway outlets based in Bakewell.